There are currently 1 user and 206 guests online. Thought I should add this game I made for the Makega.me 'Spells' pageant. It has a single-player mode, and a split-screen two-player mode. 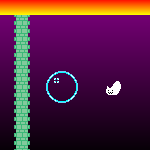 Level layouts are randomish. Maybe backspace or escape resets. I removed scores tallies and other such things to make the fireball simularion more accurate. You are a clown testing your virility. You are attempting the most dangerous show of all. The infamous knife and fireball swallowing ceremony. The trick is, you can only eat fireballs while on the ground and only eat knives while in the air. If you fail to do so, you'll mess up and kill yourself. A game made for Damian Sommer.